Una modificación del A22 con blindaje mejorado. Los primeros vehículos de este tipo se produjeron antes del desembarco aliado en Normandía. 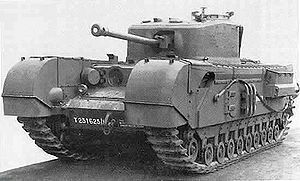 Este modelo fue además la base del tanque lanzallamas Churchill Cocodrile. The Churchill VII is a huge upgrade from its predecessor, the Churchill I, with far better armor, more track protection, and a larger health pool. The armor on this tank is thicker, especially at the turret, and has extremely small weakspots. Only TD’s of the same tier will pose a problem. 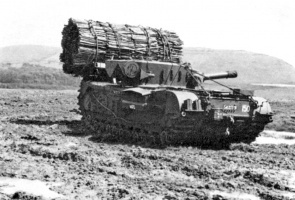 No tank can have it all though, and the Churchill VII trades a lot of its mobility for that impressive armor. The guns on this tank have a low damage per shot, with great penetration, accuracy and rate-of-fire, resulting in high dpm. The Churchill VII’s armor combined with that solid top gun, makes it one of the best in its tier for brawling. Just don’t show too much of your side armor. The upgraded version of the Churchill I has more armor then the previous heavy tank. However, the speed of this tank is even slower then its predecessor. Even the infamous Maus has more speed. When playing this tank, always angle this tank a bit to the right at about 32 degrees. This will cover the frontal weak spot for the tank and also increases the frontal armor. If you are playing stock, play like the Matilda; Use your aim time and fast reload to suppress any enemies you meet. If you are playing with the 75 mm Vickers HV, play like a Churchill I, only a bit slower. The 77 mm will slow you down more, but you need the extra penetration and damage. Focus mostly on heavy mediums and light heavies, and aim at their weakspots, because your penetration and damage will do less then expected in higher tier battles. Generally in a game of its tier, Churchill VII drivers should try to defend or push chokepoints, streets and valleys. They should not try to get onto higher ground due to their horrible gun depression. They should be very wary of getting isolated from their friendlies. When the Churchill VII is the top tank of the game. Let her rip. Due to the heaviness of the armor, basically nothing can get through the tank and if one is careful not to be flanked by enemies, they should be able to directly affect the outcome of the battle and rip the enemy team apart. Once a player commits this tank to a path or area it can be difficult to adapt to the changing battle because of the Churchill VII's slow speed and poor maneuverability. Instead, the player should consider the paths their allies choose and either provide support to one side or cover a weak spot in the line. Be very careful about getting isolated though. When placed into higher tier games the Churchill VII has to rely on placement and team support. As its speed and firepower are extremely limited against most tier 8 tanks. Utilize flanking positions by covering positions from the side. Stay at a distance and use the superior accuracy of the 77mm QQF to lay down fire against enemy tanks. As the 77mm QQF will be able to penetrate the sides of most targets, and provide high DPM support for allies. Try not to get spotted, and or be in the open as enemy tanks and artillery, will have little trouble getting through the non-slopped armor. Use its armor as a final resort against higher tier heavy tanks, by side scrapping and baiting shots into your tracks. In higher tier games the Churchill VII has limited options, but in the correct position its sheer DPM can provide large amounts of damage. Like most tanks, if caught in the wrong position there is very little chance of survival against higher tier opponents due to its low speed a health compared to tier 8 weapons. Note that when coming around corner cover, such as buildings or rocks, taking the shortest route will expose your tracks and sides for at least several seconds before you can get gun around the corner. If you are tracked before your gun gets around the corner, you're dead. Instead, try to make large turns or angle around the turn so that the enemy sees as little of your sides as possible and your frontal armor is quickly brought to bear. Alternatively, you may drive to the corner, point your tank to the corner and back up and out, using the well armored and high angled side to defend the tank against retaliation. This also protects your tracks and weak points from damage. The 75 mm Vickers HV Gun, Bedford Twin-Six Engine, and WS No. 19 Mk. III Radio should already be researched from the Churchill I, and can be mounted immediately. With these modules mounted, the tank's weight is just short of capacity, so the Churchill VII Suspension must be researched next. Next comes the Churchill VII Turret. In the Mark VII, the driver had two periscopes as well as a vision port in the hull front that could be opened. The hull gunner had a single periscope as well as the sighting telescope on the BESA mounting. In the turret the gunner and loader each had single periscope and the commander had two fitted in his hatch cupola. The armour on the Churchill, often considered its most important feature, was originally specified to a minimum of 16 millimetres (0.63 in) and a maximum of 102 millimetres (4.0 in); this was increased with the Mk VII to a range from 25 millimetres (0.98 in) to 152 millimetres (6.0 in). Though this armour was considerably thicker than its rivals (including the German Tiger I tank, but not the Tiger II) it was not sloped, reducing its effectiveness. Earlier models were given extra armour by the expedient of welding extra plates on. On the Mark VII, the hull front armour was made up of a lower angled piece of 5.5 in (140 mm), a nearly flat 2.25 in (57 mm) plate and a vertical 6 inch plate. The hull sides, were for the most part, 3.75 in (95 mm). The rear was 2 in (51 mm) and the hull top 0.525 in (13.3 mm). The turret of the Mark VII was 6 in (150 mm) to the front and 3.75 in (95 mm) for the other sides. The turret roof was 0.79 (20 mm) thick. Plate was specified as IT 80, the cast sections as IT 90.